Antique farm wagons conjure up images of bucolic country life, contented cows, and huge, rounded haystacks in the fields. While most people use paintings and other visual media to capture that ambiance, a percentage of the population actually acquire and collect these relics of a simpler time. Wood wheeled farm wagons are an important part of American history. They were still being made and used into the 1950s in some areas of the country. Although they fell out of common use in favor of faster machinery they never lost their appeal to some people. Collectors come in all shapes, sizes, and lifestyles, having one thing in common; their love of antique farm wagons. There are some challenges to collecting these pieces of history. First of all, not everyone has the space for a collection of farm wagons. They are not small and keeping them outside where they are subjected to a variety of weather conditions is not good for the materials. They will deteriorate and begin to fall apart if they are not sheltered in some way. Another challenge is identification. The value of a wagon is dependent on many things but brand name is important when estimating the value of a wagon. Certain brands are esteemed not only for their quality but for the sentimental value as well. 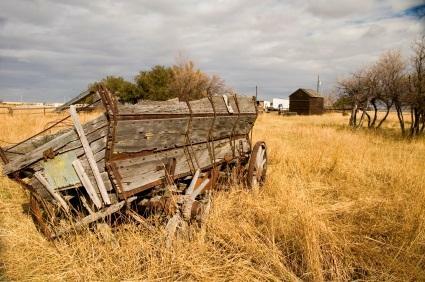 Finally, it can be difficult to locate and afford a vintage farm wagon. No matter how difficult it may be to own these workhorses of American history there are some determined collectors that will do whatever it takes to fulfill their dreams of owning a wagon. You may be wondering what exactly does determine the value of an antique wagon. Like other antiques, certain facts about the piece will cause it to have a higher or lower price than others of its kind. Manufacturer - wagons by certain manufacturers are more desirable to a greater number of collectors than others. Condition - a wagon in good condition that has all of its original parts will usually be more valuable than one that has been repaired. Provenance - the history of a wagon, including whom it belonged to or if it was part of any significant historic event, will add to the value of the piece. Desirability - desirability includes location. There are some parts of the country where you are likely to get more for your wagon than in other parts of the country. If you have one of these old wagons you may be wondering what in the world to do with it. Of course, if it is in good condition and you have a horse you can use it for driving in parades and in historic reenactment events. If it isn't in good condition, you can still use it as a decorative object in your front yard. Some people fill the bed of the wagon with flowers and plants or use it to display seasonal décor such as hay and pumpkins in the autumn. You can add to the perception that the wagon has been there for a long time by planting flowers around the base of it. If you do plan to use the wagon as part of your garden décor, you will want to use containers for any flowers or plants that you put in it. This will protect the materials that the wagon is made out of and keep it looking good for a long time. If you plan to use it for driving, you will want to restore it or have it restored to a useable condition. This is beyond the scope of most do-it-yourself enthusiasts and for safety reasons should be undertaken by someone experienced in this type of restoration. Information about antique wagons and how to identify them is well beyond the scope of this article. You can find the specific information that you may be looking for on the following sites. An old farm wagon, like old tractors and other vintage farm implements, allows you to own a piece of history. Whether you use it or display it the wagon will be a reminder of a lifestyle that is gone forever.